Many crisis and suicide prevention centers saw a large uptick in callers after the presidential election. The Crisis Text Line which connects texters with crisis counselors reported an increase of eight times the normal volume as the election results become evident. Spokeswoman Liz Eddy said that on an average day, this crisis line sees about 1,000 texters. From 7AM on Election Day to the next morning the number jumped to 2,000. The number then doubled to 4,000 from Wednesday morning to Thursday morning. The Trevor Project, the national leader in providing crisis and suicide prevention support to lesbian, gay, bisexual, transgender and questioning youth, also saw an increase in contact from the LGBTQ community. More recently, Mendelsohn said, there was a spike in unanticipated calls in June, after the Pulse nightclub shooting in Orlando, Florida. The post-election volume, he said, is 70% higher than it was then. 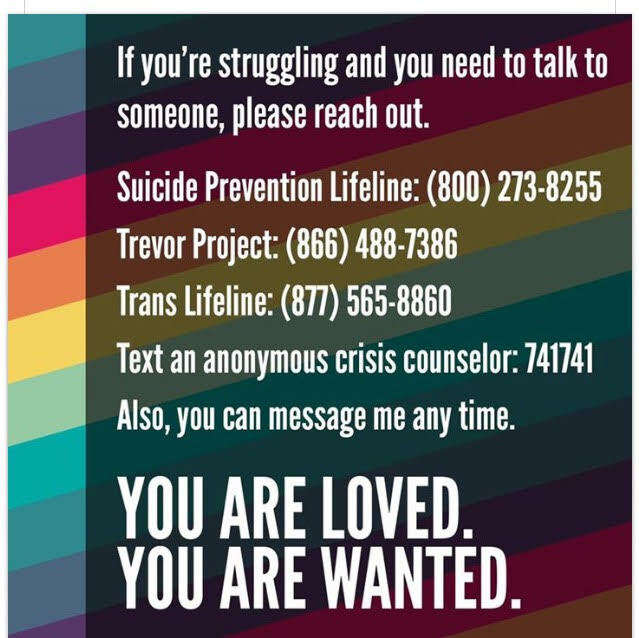 If you or someone you know is having a mental health crisis or suicidal thoughts, no matter what the trigger, these national services exist to provide people with support and the reminder that they are not alone. Get back to a routine. Limit exposure to conversations or media — social or otherwise — that aggravates feelings of hopelessness. One of the best ways to help yourself, is to help others through acts of kindness and compassion. Volunteer at a place that matters to you. Get involved with a cause that speaks to your core.